If your business employs more than a few people, it's a good bet you've got project-management problems. For example, you may have 50 email threads all related to the same project, attachments flying around all over the place, different document versions residing with different people, and so on. That's why shared-workspace solutions like Microsoft's SharePoint are so popular. They put documents, collaboration, and communication under a single, private umbrella. Alas, for many a small business, tools like SharePoint are price-prohibitive. Thankfully, there's at least one free alternative: Kerio Workspace. Specifically, Kerio Workspace Starter Edition, which is more generous and versatile than its name implies. It provides unlimited workspaces, support for an unlimited number of users, and 10GB of shared storage. 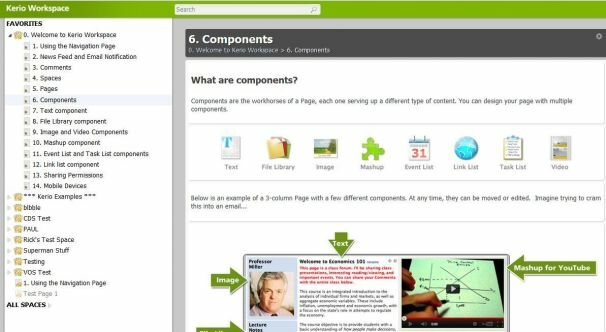 The service gives you a simple environment for creating and organizing pages, each of which can contain one or more components: text, images, video, files, Web content, links, task lists, and so on. Users can add comments to any given page, effectively adding a social component to your project. Speaking of which, there's also a news feed that lists all the latest comments, and you can configure Kerio to email you new comments. All this is easier experienced than explained, which is why I recommend checking out Kerio's online demo. It lets you poke around in and interact with an actual workspace. Cleverly, the demo includes a number of how-to guides as part of this workspace, meaning you get to learn how to use various features while you're actually using them. It took me about 15 minutes of fiddling with Kerio to get a good feel for how it all works. In other words, the learning curve is pretty shallow, so your team should be able to get up to speed quickly. There may be prettier collaboration services out there, but Kerio definitely gives small organizations the tools they need to reduce email overload and amp up project productivity. And the price couldn't be more right, so why not give it a whirl? If you've found a workspace solution you like better, tell me about it in the comments.